“I Tre Falchi”, the three hawks, is a 17th century Umbrian farmhouse in the small village of Torrececcone. The property when first discovered required a bit of vision but now has been carefully restored with modern and contemporary touches. The spacious living areas to the cosy TV room, inside and outside give large groups or families room to enjoy their summer vacation. The grounds of the property are meticulously maintained with lots of grassy areas, flowers and shaded areas for meals. The infinity pool and living area allow you to take in the pleasing views of Umbria while relaxing on a lounge or in the pool. 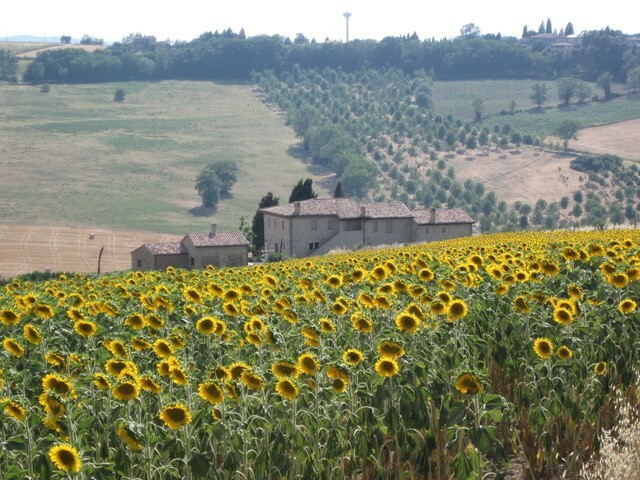 The owners from New York have been vacationing in Umbria since 2000. Living in New York, they enjoy the escape to Umbria in the summers and decided to buy a property and restore it to their style. The restoration focused on recuperating old materials when possible and using traditional materials with marble, travertine and granite throughout. Bedroom 1: Guest double bedroom with ensuite bathroom with shower and 2 sinks. Bedroom 4: Room with double bed and single bed with trundle. Bathroom 4: Shared bathroom between Bedroom 3 and 4. Shower and small bathtub. Bedroom 5: Double bedroom with ensuite bathroom with large shower. Large Annex apartment with open kitchen, living and dining with fireplace.